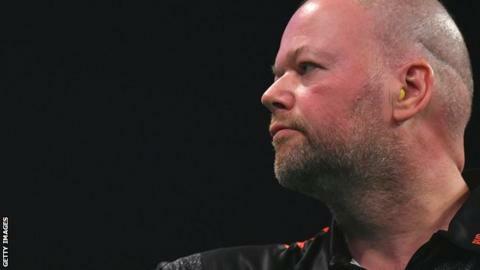 Raymond van Barneveld's final Premier League campaign will end on Thursday after his elimination from the tournament was confirmed in Rotterdam. The Dutchman's loss to Daryl Gurney, coupled with Michael Smith's win over Gerwyn Price, confirmed he will be bottom of the table after nine games. Five-time world champion Van Barneveld, 51, has said he will retire from competitive darts at the end of 2019. His last ever Premier League match will be against Michael van Gerwen. Van Barneveld was greeted to the stage by a vociferous home crowd, who were left deflated by his exit from the competition. He plans to keep playing until the PDC World Championship, which takes place in December. Reigning world champion Van Gerwen thrashed Peter Wright 7-1 to return to the top of the table, after previous leader Rob Cross let slip a 5-1 lead to lose 7-5 to Mensur Suljovic. James Wade drew 6-6 with Belgian "contender" Dimitri van den Bergh in Wednesday's other match. The first eight players - including Van den Bergh - to fill in for the injured Gary Anderson have failed to register a win and the last man to get the chance to do so will be Jeffrey de Zwaan, who faces former world champion Cross on Thursday.